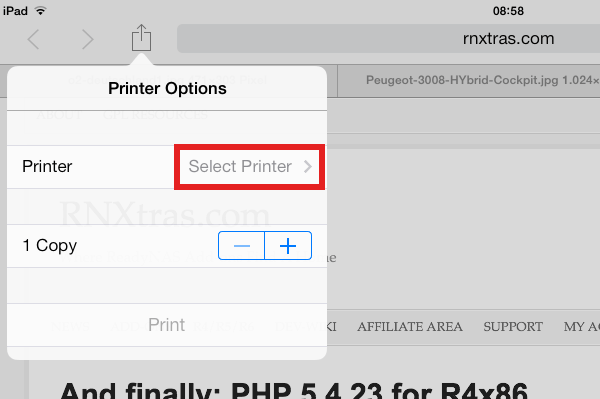 After instalaltion RNAirPrint requires you to configure your locally (USB) or network attached printers. To do that, first call up the CUPS web interface. 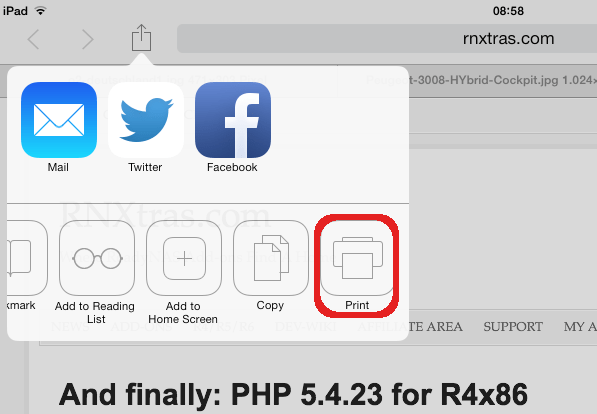 This can be done either from within Dashboard using the “RNAirPrint” icon on the front page or by clicking on the “Launch” button for RNAirPrint on the “Installed Apps” page. 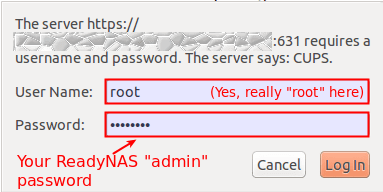 And lastly, you can go to the main web page by entering “https://<ip of your NAS>:631” directly into your browser’s address bar. Once at the main web interface, switch to the “Administration” tab. There you then click on the “Manage printer” button. After successful authentication you will be presented with a list of choice for attaching a printer. There are three sections: Local Printers, Discovered Printers and Other Network Printers. If your printer was automatically discovered it should show up in one of the first two sections. If it isn’t – which is the case most of the times – you first need to tell CUPS where to find your printer. This is done in the third section. 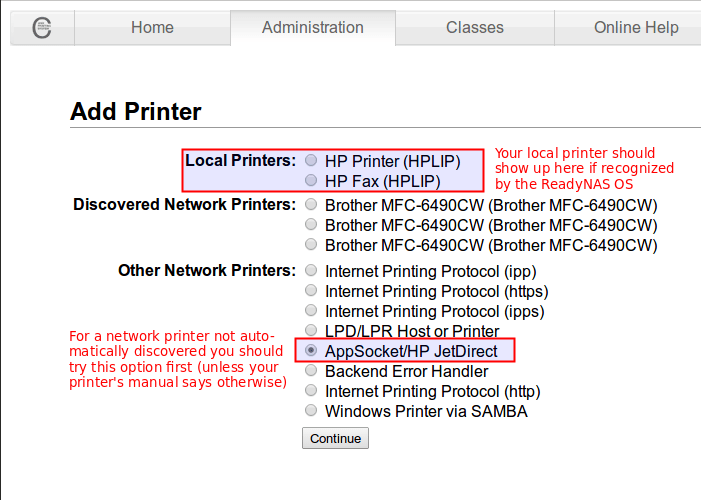 Choosing AppSocket/HP JetDirect works well for most modern printer but to be safe you may wish to consult your printer’s manual. 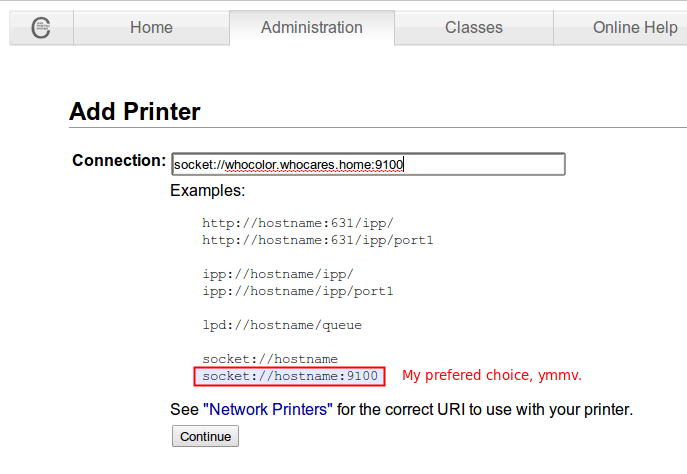 Continuing with this setup, you will be asked for a URL where your printer can be reached by CUPS. You can enter either a host name or an IP address. If unsure the IP address is the better choice in most cases. 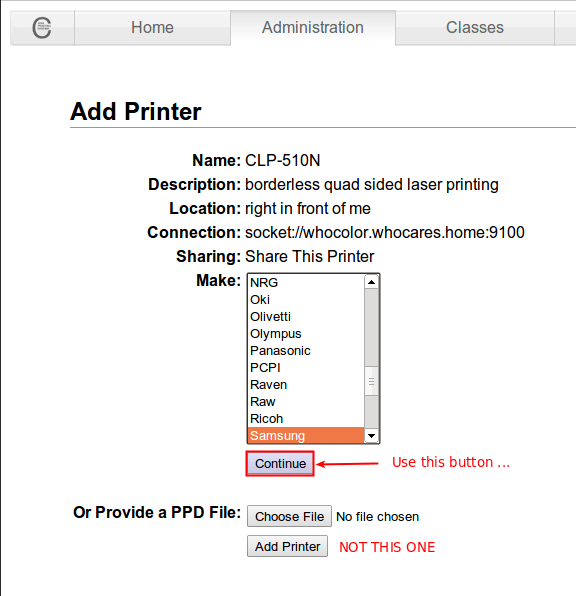 After clicking on “Continue” you’re taken to an input form where you can add some description for the current printer and also enable sharing the printer on the network. When giving a name to the printer make sure that there are no spaces in it. 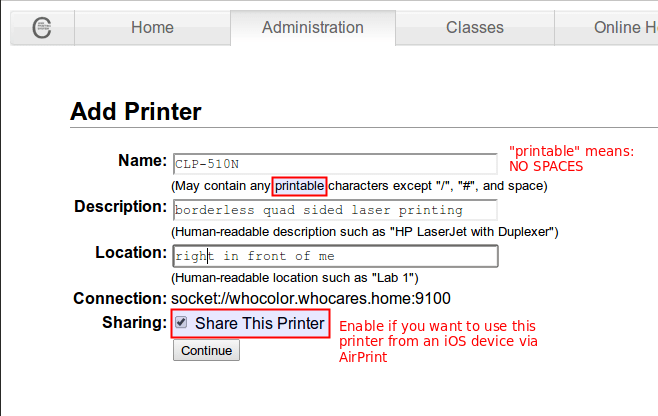 If you want to be able to use that printer from an iOS device, make sure to enable the “Share This Printer” option. After clicking “Continue” yet again you can finally select a manufacturer. 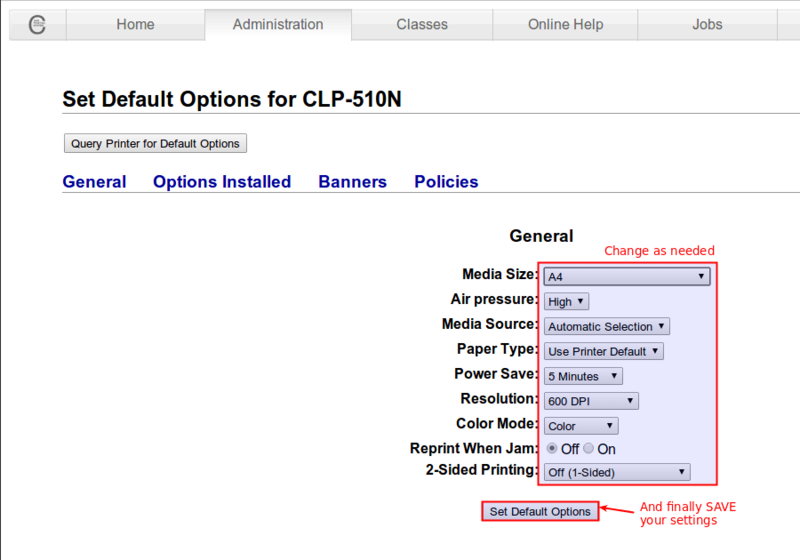 Make sure to click on “Continue” and keep the mouse clear from the “Add Printer” button on this screen! Also try to use a short, meaningful description because that’s the name the printer will show up as on iOS devices. 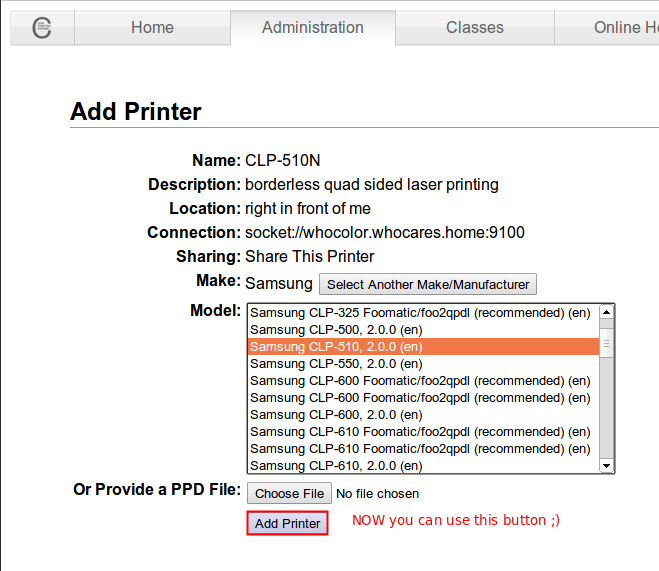 Now you can finally click the “Add Printer” button to add your printer to CUPS. However, you’re not finished yet. One final screen allows you to set the default properties like page size and resolution .CUPS should use for that printer. One last click on “Save Default Options” and you’re done. To test whether your iOS device can see the printer properly, fire up Safari and open a random webpage. Tap on the “Share” button to the left of the address bar and select “Print” from the menu that pops up. You will now see an empty list of printers. Tap on “Select printer”. 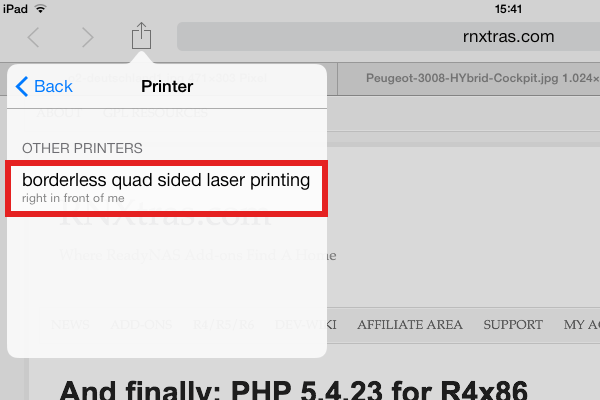 This should bring up a list of available printers where hopefully the one that you just defined shows up as well. From the screenshot it is also obvious why a short description is better. Oh well. After tapping on the printer, thereby selecting it, you may also get a panel with some options you can change for the current print process. For this part, the printer we’re using is an HP Laserjet 1012, connected to the USB port of the ReadyNAS. Please note that Windows will use the name you gave the printer. Take note of the URL your browser shows you. Copy it somewhere safe (a Notepad window might be a good idea) and while doing so remove the “s” from the https:// in the URL address so that it’s just http://. This will open another input box, where you need to select the “Select a shared printer by name” option and fill in the URL (again: not the https:// one but the one with http:// instead) you copied from the RNAirPrint admin earlier. With a click on “Next” you tell Windows to go and retrieve the printer information. If everything went ok, it will display the usual dialogue for selecting the printer driver. Just select the appropriate driver and finish the installation as you would do for a locally attached printer. The printer attached to your ReadyNAS should now show up on your list of available printers in Windows.